Out of the box review and initial impressions. A full review post use, and swapping blade to a proper blade are going to be in the works, but I figured I would post this up now to give you guys a heads up. I may just edit this review when I am ready, who knows? I picked up a Chicago Electric #98194 on Friday with a coupon I have been sitting on for a few months that expired on Sunday, so it was a use it or lose it sort of thing. The coupon brought the price for this 12” sliding compound miter saw down to $109.99, and then throw the 2 year warranty on top of that, and taxes and I walked out the door for just a few cents over $140.00. If you are familiar with Miter Saw pricing these days, a B&D or Skil 10” non slider runs around $125.00 to $135.00 pre-tax, so for the price of of a cheap 10” non slider, you can get a cheap 12” slider, but is it worth it? As you may, or may not know, the Chicago Electric Tools line, just like almost everything else at Harbor Freight, is just another Asian import line of tools, typically they are identical in all aspects save for coloration of plastics, stickers and / or paint / powder coatings as other brands on the market. Without giving up the who / where / why / when I can say that this miter saw, appears in all aspects aside from what I mentioned above to be identical to at least 3 other brands that I see in LJs shops… So I know this one gets around quite a bit. The 10” version gets a LOT of bad press, especially with the blade guard, but so far reviews on the 12” are favorable. The guard on mine, well it’s pretty basic, and seems functional enough. Time will tell when I go to replace the blade! A few things worthy of note here. The packaging that Harbor Freight is using these days, especially the foam blocking material, is FAR superior and protective than the packaging I am used to from them. This thing was very secure in its box. Now with that said and out of the way, let’s get down to the nitty gritty. Out of the box, it took me a minute to figure out how all the knobs, levers, buttons and other various controls worked. Checking with various squares, and drafting triangles finds that the fence / blade etc… are all dialed dead in from the factory, and that the stops at 22.5, 30, and 45 degrees are exactly where they are supposed to be, and that he blade tilt measurements are where they are supposed to be. No adjustments to the fence, or anything of that nature was needed. The pointers for both rotate, and bevel adjustments were misadjusted, but easily brought into line with nothing more than a #2 Phillips screwdriver. Overall the saw looks solid, and well thought out. and the fit and finish where it matters is top notch. The castings fairly clean and well made, and finished reasonably well applied (looks like gray powder coating) However there are areas on this saw, that were obviously neglected in manufacturing, as there are some rough spots on the table, and the frame that are in non functional areas, that it looks like instead of cleanly machining the casting excess off, they must have just whacked it off with an angle grinder and called it good. Now whoever did this job does nice enough work, but you can tell there is a slightly irregular surface that looks very odd… I guess that is part of the trade off for the lowball price tag. The routing for the power for the saw, as well as the battery compartment for the laser are both, well in the way of the lockout device for raising / lowering the head. A touch of fiddling with it and you can get them in a workable position, but it’s annoying that you have to do it. The lock down mechanism for the table is simply a thread in rod, no quick release here. It is an obnoxiously crude design, but it functions so well it is hard to complain about it… Just twist the know counter clockwise to loosen, set your position, then turn clockwise to tighten. Very intuitive. All of the control surfaces and plastics are well machined, and solidly cast. The handle feels good in the hand. Overall, I believe that swapping in a quality blade and just ignoring the funky machining in cosmetic areas, all the while just remembering that this saw cost me less than a non sliding 10” Ryobi, or B&D CMS, and I will be happy as a clam. All the function I want is there, and it all appears smooth. The moment of truth will come when I plug it in, and send it sailing on its maiden voyage across some 2×10s that I need to crosscut at a compound angle (odd piece of support decking for the hot water heater needs to be replaced…). I will most likely update my review then, and again in a few months to a year to at least give a reasonable term usage review of this tool. - The bevel stop at 0 is dead on perfect. No problem. The not so good but not terrible. - That blade. Now a low quality blade is NO surprise on any saw under $1,000.00. But just HOW bad this blade is will make your skin crawl. This thing relieves me permanently of ANY desire to EVER buy any bits or blades from Harbor Freight. I will have to grab a Freud Diablo D12980X and swap it over before I can write even a basic how this thing cuts. I think I would have been happier had Harbor Freight just left the blade out of the whole package…. This blade is every bit as bad as the Drill Master hole saws I got from them. ICK! - Dust collection. We don’t need no stinking dust collection! Oh boy is DC on this thing rotten. Now I can’t compare it to other 12” sliders, but I CAN compare it to a couple of 10” non sliders. I think part of the problem is the slider design itself, so there is no feasable way to have some sort of ramp to direct dust and chunks (did I mention the lousy blade?) to the dust bag. The dust bag is EXTREMELY coarse, and for the most part useless. It filled up almost completely on the first cut, and the saw simply proceeded to spew dust from there. A shop vac hooked up to the port helps, but not enough. This thing REALLY needs to be used outside, or with a good dust hood and a full on dust collector… Now as most of us know, miter saws are lousy for dust collection, and this one is no exception. The only other 12” slider I have been around in action is the DeWalt at Woodcraft, and this seems no better, and aside from the lousy bag, not really worse. It’s pretty much middle of the road here. UPDATE 6/7/2012* I have owned and used this saw for a year and a half now, and as the miter saw is one of my most commonly used tools for cutting long stock to length, it gets a LOT of use… I have found this to be a valuable tool, but my star rating goes neither up, nor down. It does what I expect it to, and to be blunt, has been a MUCH better machine than can be reasonably expected for a 12” sliding miter saw that sells on sale for well under $150.00! Lastly, in case you have forgotten, this thing is a behemoth. An absolute beast. Mounted to the stock platform on my B&D Firestorm stand, the entire platform would move up and down about 3/4” while cycling the slide mechanism which would throw cut accuracy off. That is NOT a fault of the saw, but rather a design flaw of the B&D miter saw stand. I HATE having the saw on my big workbench full time, and I have a good idea how to fix the design flaw with the B&D stand… So I may just rig that back up and go with it… For several reasons. Not the least of which is the stand can fold up and the entire thing be hung on a wall. Maybe one of these days I will upgrade to one of those Hitachi sliders that have the slides facing forward, but until then, this saw does what a 12” slider is supposed to do, and does it reasonably well. This machine is not one I have buyers remorse over by any means, but by the same token, this won’t go on my HF Gems list either. 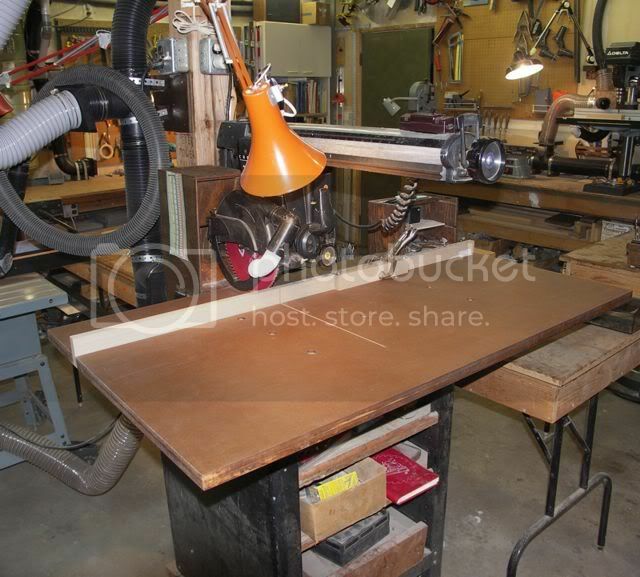 I still wish you could have found a radial arm saw. I could use a refurbishing buddy as I go through my own, but I’m glad you like what you got. Thank you for taking the time to do a review. I don’t think any of us really expect top quality at bargain prices, but it is good to see the good/bad of a bargain tool. Some need it once, or for one project. Some cannot afford better. It is good to see what you really get for that price to help when times are tough and dollars are short. Reviews of DeWalt, Makita, Milwaukee, etc are readily available on the internet. Not too many comparing B & D, Firestorm, HF, etc. but probably more people on this forum use those than the mid-range. Good luck with the saw. It probably wouldn’t hold up to professional use but for the hobbyist it should be fine. I am curious to see how those roller bearings will do over time. SAW ( sorry, I had to do it!) you finally got it. As you write m for the price it cannot be beaten. I am satisfied with my 10”. By the way you can find 20% discount coupon on the internet anytime you need one, just Google HF 20% off. I really buy anything at HF with out 20% off coupon. I suspect you will find a 12 inch miter saw, even though a cut below the best, better for you than a RAS. As noted before, you need portability, and that does not describe RAS’s, which can be a little touchy when it comes to maintaining calibration. I look pretty closely at my RAS at least once a week, and pull out the square if necessary. And I can’t remember the last time that RAS was moved even an inch. It works for me, but I don’t need portability, and I am used to the old saw. I am sure you will resolve the DC issues with it, just as I am doing with the TS. Has anyone tried to dust proof a RAS? That is next on my list. My RAS leaks entirely too much…......er…....chips. The dust is pretty well controlled, but it sends out surface chips, especially from plywood. Thanks for the review. Babying my left wrist, as noted before…...no shop time today. Jim Bertelson- The dust collection problem with a RAS is simple if you only use the arm in the 90 degree position. Just build a box behind it big enough for the blade carriage to fit inside when it’s behind the fence and hook up a good dust collector. If you want angled cuts use jigs to position the board at the angle rather than moving the arm. I use a RAS instead of a Miter saw because I have one and my grandfather was partial to one back when they were the only thing around. Maybe I’ll go through mine with HokieMojo? Hokie- What RAS do you have? Mine is a B&D/Dewalt Powershop from the early 70’s before they started cheaping them out. You are right on that Barry, at least with certain tools. That is why when I got my clamps, I literally picked through the entire stack and grabbed only the ones that didn’t have obvious defects. Jim- I made my box so that the sides go all the way up to the fence and that made a difference, also the top goes all the way wut is hinged wo that it will rise if I raise the height of the saw arm. If the dust collector is on I get very few chips from the box alone. I don’t even need a hose hooked to the dust gaurd like some people do. I do admit I get some dust against the fence, but that’s unavoidable unless you have a big gap where the blade passes through because all the chips fly from the bottom of the blade. Hadn’t even thought of moving the box closer to the fence, and a hinged top sounds good. I will do that first to see if that is all I have to do. I think I will make some acrylic guards, although the inside one may end up being a little skimpy. Got to get the TS DC done first, it is a real problem, although already improved. Remember I use a 10” and the design of the whole saw has been changed about 2 years ago. To change the blade with the new design is a piece of cake that was to the cake in the past. I use a 60teeth blade and I too get nice cuts.